MILWAUKEE — Turnovers just might be the most important statistic in football. 49ERS OFFENSE – OVERALL (15), RUSH (4), PASS (22). 49ERS DEFENSE – OVERALL (11), RUSH (7), PASS (15). PACKERS OFFENSE – OVERALL (10), RUSH (19), PASS (10). PACKERS DEFENSE – OVERALL (4), RUSH (15t), PASS (2). 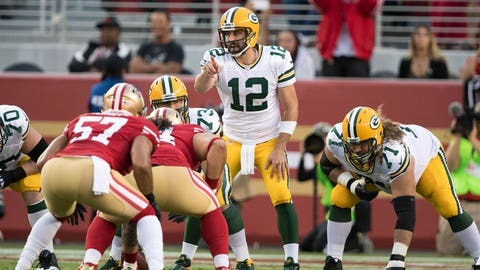 STREAKS, STATS AND NOTES – First meeting for teams in Green Bay since 49ers beat Packers 23-20 in NFC wild-card game on Jan. 5, 2014. … 49ers’ first Monday night game since opening 2016 season with 28-0 win over Rams. … 49ers ran 92 offensive plays in loss last week to Arizona, most by team since 1970. Also had 33 first downs, most by team in game since getting 36 on Oct. 18, 1998 against Colts. … QB C.J. Beathard set career highs last week going 34 of 54 for 349 yards. … FB Kyle Juszczyk fifth among NFC FBs and RBs with 197 yards receiving. … George Kittle leads NFL TEs averaging 17.3 yards per reception. … WR Pierre Garcon averaging 129.5 yards receiving with two touchdowns in last two games vs. Packers. … SF defense fifth in NFL allowing 3.37 yards per carry on first down…. DL DeForest Buckner has 3 1/2 sacks over last five games. … CB Richard Sherman‘s 32 INTs since 2011 are most by active player in that time. All came with Seattle. … Niners have one INT this season, three total takeaways, worst in league. Their minus-8 differential also NFL worst. … Packers coach Mike McCarthy was 49ers offensive coordinator in 2005. … QB Aaron Rodgers has 105.1 passer rating against NFC West since 2008, tops in NFL. … Rodgers has 36 games with three or more TD passes since 2012, second behind Saints‘ Drew Brees (39). … RB Aaron Jones has rushing TD in two of past three home games. … WR Davante Adams tied for NFL lead for most TD catches since 2016 (26). … Rookie WR Marquez Valdes-Scantling had first career TD catch last week. … Packers’ defense third in NFL in forcing three-and-outs on 28.8 percent of drives. … LB Blake Martinez had two sacks last week, first career multi-sack game. … S Ha Ha Clinton-Dix has three INTs and sack over past four games. … Fantasy tip: McCarthy says he still believes in Mason Crosby following kicker’s awful game against Detroit, going 1 of 5 on FG attempts and missing his only extra-point try. Crosby was 10 of 11 on year before last week, including two 52-yarders in Week 4 against Buffalo. He also missed extra-point attempt in that game.